The oxygen level in the blood can become lower, and the brain will signal your body to awaken. You will probably not remember these instances; however, the disruption of your sleep will affect your ability to function the next day. If left untreated, sleep apnea can lead to cardiovascular problems, headaches, chronic fatigue, and mood disorders. 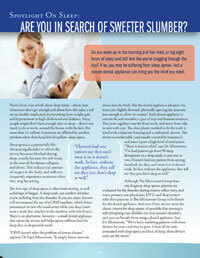 Relief from chronic snoring and sleep apnea is available at The Silverstrom Group. Many people are surprised to learn that our dental professionals are experts in the treatment of these breathing disorders. We have helped many of our patients get a good night’s sleep once again, and we would welcome the opportunity to do the same for you. Most cases of excessive snoring and sleep apnea are rooted in the same cause: a blockage of the airway between the nose and the voice box. A partial obstruction of this airway will result in snoring, while a complete obstruction will result in the temporary cessation of breathing that is the primary symptom of sleep apnea. The blockage occurs when the muscles that support your soft palate, tonsils, uvula, and tongue relax, causing the airway to narrow and these anatomical structures to fall back toward the throat. Before recommending a course of treatment, our dentists will collect information about your medical history and examine your mouth, jaw, and throat. We find that many of our patients respond well to intraoral appliances that help to keep the airway open during sleep. The device fits comfortably in the mouth, where it moves the jaw and tongue forward and causes the muscles of the airway to relax. This prevents the airway from becoming obstructed, allowing patients to sleep peacefully throughout the night. There are some rare instances of sleep apnea in which the brain simply fails to deliver the proper signals to the muscles involved in breathing. In these cases, our dentists will refer you to a sleep disorder specialist who can provide the treatment you need. If you would like to learn more about sleep apnea, please contact us for a consultation. We look forward to providing you with the most convenient and comfortable dental experience you have ever had.